Looking for Skip bin hire Burraneer ? MCM Skip Bins has provided skip bin hire to residents, builders and business owners in Burraneer since 2003. You can easily organise a skip bin. We have a range of bin sizes, for your smaller job 3 and 4 cubic metres and for larger waste removal 6 and 8 cubic metre bins. You may have steep or tight access, perhaps it’s a narrow driveway or there are low trees. We have several different size trucks and are happy to take the time working out with you what the best options are for easy placement of the bin to make loading as easy as possible at your home or job site in Burraneer. Our landfills are under a lot of pressure with all the waste we add to them each year. We want you to know that we think it’s important to do our part and take care of the environment in the ways offered to us through this industry. We take our time with each skip bin to sort out materials that can be recycled to minimise the negative impact that waste has on the environment. Burraneer is a prestigious suburb in the Sutherland Shire approximately 26km south of Sydney’s CBD. The pristine waters of the Port Hacking River surround all sides of the illustrious peninsular that is Burraneer. Woolooware Rd sees state of the art architecturally designed homes cascade to the waters edge where meticulously maintained boats sheds lead out to luxury cruise boats, jet skis and sailing vessels. Woolooware Rd runs all the way down Burraneer. You can find local shops with a corner store, bakery, café and other services. You continue further down and branch off to find The Royal Motor Yacht Club and Burraneer Bay Marina in Fernleigh St. Burraneer Bay Public School is one of the bigger schools in the area catering from kindergarten to year 6. Homes in this area are at the forefront of design. We are proud to be a leading part of the local experts who help trades execute new builds, renovations and landscaping in Burraneer. 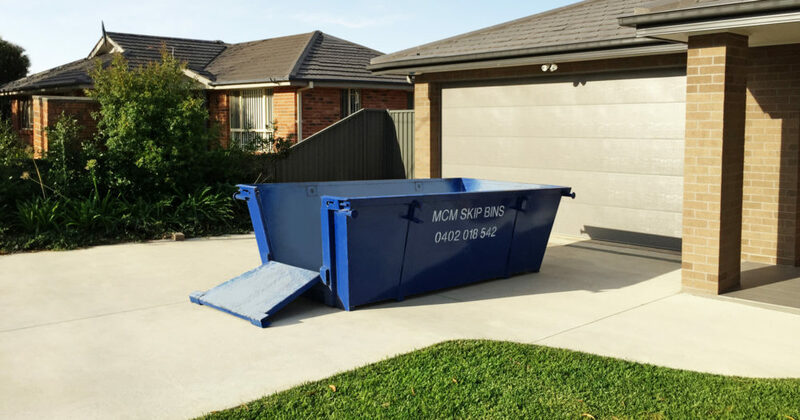 We enjoy providing skip bins in this friendly part of the Sutherland Shire. Our customers in Burraneer only accept true value and good service. We thank them for loyalty over many years. When can I get a skip bin? Usually the same day, Monday to Saturday. If you want an AM delivery you will need to ring the day before. How can I pay for the skip bin? Payment is made on drop off of your bin. You can pay by cash, VISA or MasterCard. Where will you place the skip bin? We usually place the skip bin on the driveway or in the front yard. Call 0402 018 542 and we will listen to your needs and work it out together. How do I order a skip bin from MCM Skip Bins? How long can I have the bin? Usually 7 days. You can speak to us if you have special requirements. Does my bin automatically get picked up after 7 days? No, you need to call 0402 018 542 to arrange pick up of your skip bin. What items are not allowed to go into the skip bin? Asbestos, liquid, food waste, hazardous materials such as any fuels, paint, asbestos, gas bottles, poisons etc. There is an extra charge for mattresses and tyres. How far can I fill the bin? To the rim only. An over filled bin is hazardous and fines are charged by the police and RTA officers if we travel with an over loaded bin. Over filled bins will not be removed. A charge for unloading the bin will apply. Do your skip bins have wheelbarrow access? Yes you can request a skip bin with a rear-opening gate. What should I do before my skip bin arrives? Make sure the area you want the bin is cleared of rubbish, branches, vehicles etc. All cars are out of the garage or driveway before we arrive. Do you recycle the waste? Yes. MCM Skip Bins recycles any materials that can be reused or reprocessed reducing landfill and cost to you.